Askorbinka with Rutin 50 tbl. Askorbinka with Rutin. Dietary supplement. Askorbinka is a biologically active food supplement, source of rutin and vitamin C. Vitamin C is involved in the regulation of oxidation-reduction processes, metabolism of carbohydrates, blood clotting, during the synthesis of steroids and normalizes capillary permeability. It plays an important role in the formation of collagen, which is necessary for growth and repair of bones, cartilage and connective tissue. Promotes the absorption of iron, is very useful for healing burns, wounds and bleeding gums, prevents colds. Rutin is an anti-sclerotic element that normalitzes the permeability of capillaries and reduces its fragility, prevents bleeding, reduces blood clotting, improves cardiac muscle contraction. 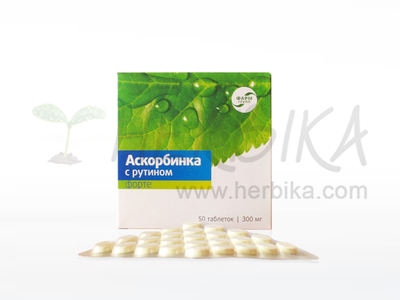 1 tablet contains: Vitamin C 70 mg – 87% of the recommended daily allowance (ascorbic acid), rutin 30 mg, glucose (filler). Recommended dosage: 1 tablet per day during meals, rinse with sufficient amount of water. The recommended period of use is 1 month.